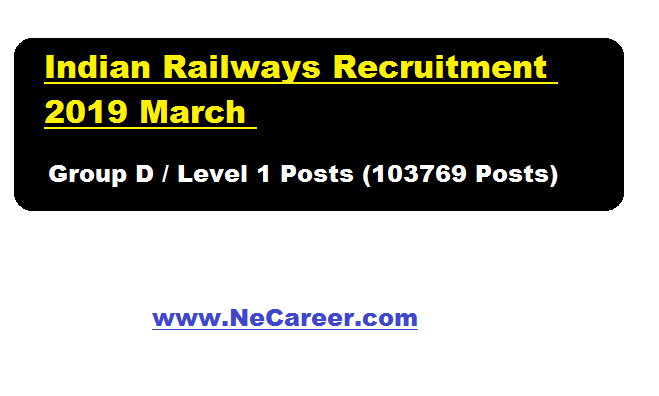 Indian Railways Recruitment 2019 March - Group D/ Level 1 Posts @ RRC:- Welcome to North East India's No. 1 Job Portal NeCareer.com . Indian Railway has published a huge recruitment notification in march 2019. Online applications are invited by RRBs on behalf of RRCs from eligible Indian Nationals and other nationals as brought out at Para 4 of this CEN for various posts in Level 1 of 7th CPC Pay Matrix in various units of Indian Railways. Age Limit : 18-33 years. Age relaxation is admissible for SC/ST/OBC/ PH/ Ex-servicemen candidates as per rules. Educational Qualification: Candidates must be 10th pass (OR) ITI from institutions recognised by NCVT/SCVT (or) equivalent (OR) National Apprenticeship Certificate (NAC) granted by NCVT. Application Fee: Rs. 500/- (Rs. 250/- for SC/ST/Ex-SM/PWD/Female/ Transgender/ Minorities/ Economically backward classes) (Rs. 400/- will be refunded after candidates appear in 1st stage CBT, Rs.250/- will be refunded for reserved category candidates) to be paid online OR by payment challan at SBI / Post Offices. Selection Process: The entire recruitment process shall involve Computer Based Test(s), Physical Efficiency Test (PET), Document Verification and Medical Examination. Interested and eligible candidates are required to apply online through official website www.scertassamonline.in. and appplications complete in all respect should be submitted ONLINE to the chosen Railway Recruitment Board till 23.59 hrs of 26.04.2019.